Built 1871-1872 as private theatre by Ferdinand Fellner & Hermann Helmer. 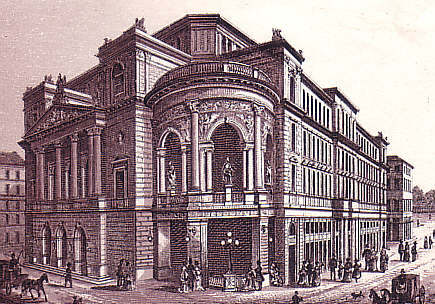 Opened 15 September 1872 with Schiller's "Demetrius" (in a version by Heinrich Laube). Ca. 1500 seats. Destroyed by a fire on 16 May 1884. 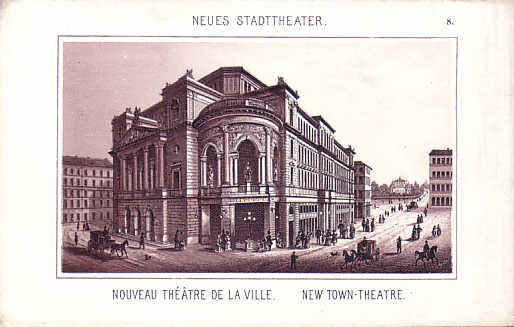 Caption: "Neues Stadttheater - Nouveau Théâtre de la Ville - New Town-Theatre"